Eclipse owners Dani and Mark Bigelbach traveled with the non-profit organization, CoHope Cares, to Costa Rica for their Mission of Joy Project. The group was small in numbers, but big in willingness to dig in and get some work done. 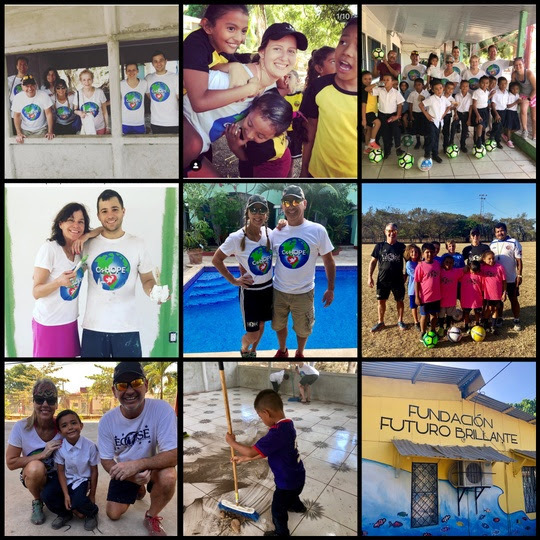 The mission included painting a new addition at a primary school in Matapalo, Guanacaste, Costa Rica, with opportunities to interact and play soccer with the beautiful children during their recess time. Their smiles, joyful spirits and desire to engage with us was contagious. The space that we painted was a soon to be art/music storage room at Matapalo School in Guanacaste. We were thrilled to finish the interior and exterior with two plus coats of CoHope Green and Bridal Veil White paint. The room is lovely!! New windows were installed on day five and the project was complete! We also attended a soccer practice one afternoon and we donated soccer balls, pumps and Eclipse t-shirts to the team. The children were very gracious and are all about soccer! They were so excited and immediately put the shirts on and ran out onto the field with the soccer balls. We did manage to gather them together briefly for a few photos. The joy was definitely spread through smiles, painting, play and soccer! We felt so fortunate to be able to participate in this Mission of Joy with CoHope Cares! We look forward to doing this every year, while expanding the opportunity for others to join us! Check out CoHope Cares at www.cohopecares.org Bridging borders through Service, Sport, Faith, Friendship.